Whether it’s a campfire cookout, an impromptu jam session with friends in a garage or just a quiet afternoon to let out your artistic side in the park, having a great acoustic guitar that travels easily while maintaining a quality sound can certainly come in handy. And when it comes to the best travel guitars, you don’t have to sacrifice quality construction, playability, deep acoustic sound or the ability to hold a tune. There are a host of modern acoustic guitars that make excellent travel companions, whether it be for small size, light weight or their ability to take a beating via airport security. What Makes a Good Travel Guitar? Compact size. It’s not always possible to bring a full-sized guitar with you on your travels, especially if you’re flying or backpacking. There are some ultra-compact guitars designed for portability, but a good small-scale guitar is also an option. Durability. Let’s face it, your travel guitar is going to get knocked around a bit. Whatever guitar you go with should be able to stand up to the abuse. Noise level. What this means for you depends on your needs. If you want to jam with other musicians, you’ll want a good mini guitar that can pump out enough volume. If you want a guitar for silent practice in hotel rooms, then something quieter is a better option. There are even specialty guitars that are nearly silent, but give you the full acoustic experience simply by plugging in a pair of headphones. There are a ton of guitars on the market that check these boxes, some good some not so good. Here is a rundown of our favorite acoustics for on-the-go music. The KLOS carbon fiber travel guitar has just about everything you could want in a portable guitar. Launched via a series of wildly successful Kickstarter campaigns, the KLOS guitar is an incredibly playable full-scale length guitar that features a detachable neck and the high tech durability of carbon fiber. And despite its compact size, this guitar has a ton of volume and a beautiful tone. Plus, the KLOS guitar is just a blast to play. The neck and the action feel very comfortable, and its light weight means that it’s easy to keep playing for hours. With a full 24-¾” scale length, the KLOS guitar is great for experienced players that need a durable guitar for travel. But its small size and easy playability means that it’s also perfect for beginners or children just starting their guitar journey. KLOS Guitars was founded by brothers Ian and Adam Klosowiak, and their guitars are handmade in Utah. For a great-sounding, packable guitar that you won’t have to worry about knocking around a bit in your travels, it’s really tough to beat the KLOS. Traveler Guitar is a company dedicated to producing the best and most innovative travel guitars you’ll find anywhere. Born in 1992, Traveler Guitar began as a pet project and quickly blossomed into a booming brand as traveling guitarists everywhere scrambled to get their hands on one. Their awesome Traveler Guitar AG-200EQ gives you the sound and feel of a full-scale acoustic guitar in a compact, travel-friendly package. Traveler Guitar is able to accomplish this by doing away with the headstock, and with some innovations in body construction. But this guitar doesn’t skimp on anything, least of all sound. The mahogany neck, back and sides, and solid spruce top produce amazing tone that puts many traditional guitars to shame. This guitar also features a built-in headphone amp, and fits easily in airline overhead compartments when packed into the included padded gig bag. What’s that? 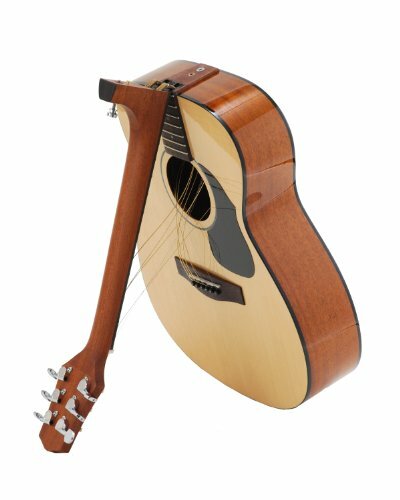 A full-sized acoustic guitar that easily folds down for travel? You bet! The Voyage-Air Transit Series VAOM-2 is a full 25.5″ scale guitar that has a specially-designed hinge at the fourteenth fret, easily allowing it to fold in half and pack away. And it even manages to stay in tune. While the innovative travel design is its main selling point, the VAOM-2 is a solid guitar in its own right. It features mahogany neck, back, and sides, and a laminated spruce top that gives its tone real punch. Playability is nice, although you may have to get used to the wider fingerboard. There are better guitars in this price range, but none that match the portability of this one. And smaller, cheaper travel guitars just don’t have the same tone and volume as a full-sized acoustic. If you’re a frequent traveler, the Voyage-Air VAOM-2 is your best bet for a true full-size acoustic guitar that you can take with you anywhere. 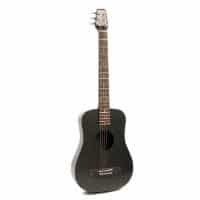 Combining durability, projection, tone and the convenience of a ¾ sized body, the Yamaha JRI Mini Folk Guitar provides supersized value in a compact package. But smaller doesn’t mean cutting corners. The JR1 features a solid spruce top and the easy action that Yamaha is known for. On top of being one of the best travel acoustic guitars, the JR1 does double duty as the perfect learning instrument for children or someone just learning proper finger placement for chords, because of its classic shape in a scaled down size. Another travel-worthy acoustic with distinctive body styling, the Washburn Rover delivers huge projection in a compact package. Washburn is also the only acoustic guitar on our list specifically designed to fit in the overhead storage compartments on airplanes. This is a definite plus for the musician with frequent flyer miles to burn. A solid mahogany body and neck means that sound quality will match the volume on the Rover. With all of this to offer, my favorite feature of the Washburn rover is the full size 24” scale neck, which is hard to come by in the travel-friendly acoustic guitar category. Martin Backpacker Travel Guitar. A solid mahogany travel-sized guitar from famed guitar maker Martin. 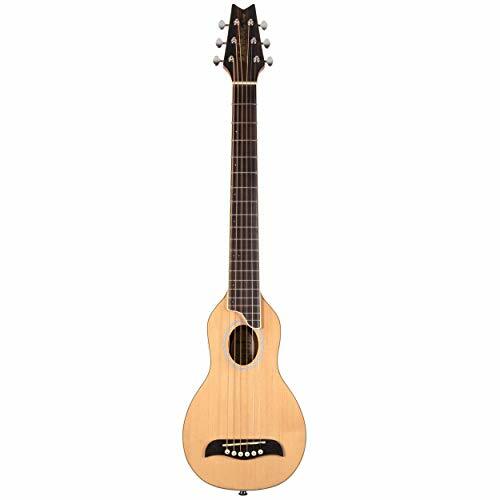 Cordoba Mini O Travel Acoustic Nylon String Guitar. An all-around great little guitar for nylon-string players. Yamaha SLG200S Steel String Silent Guitar. This nearly-silent full-scale guitar is great for practicing when you can’t make a lot of noise. Add headphones for practice time, or plug in to an amp in jam scenarios. Martin LXM Little Martin. An affordable small-scale guitar from iconic guitar-maker Martin. You can’t go wrong with this one. Traveler Guitar Ultra-Light. Another nearly-silent full-scale guitar, the lack of a headstock makes this one ultra-compact. When it comes to portable musical instruments, few things can spruce up a gathering as much as a travel acoustic. And the guitars on this list prove that you don’t need to sacrifice quality for portability. Whether you just need something more compact, a good cheap guitar that can take a beating, or something that you can cram into an overhead compartment, a good travel acoustic will suit your needs. Try out one of the above models and take your music with you on your journeys. Great post. Voyage-Air Transit Series VAOM-2 is awesome guitar but I’m afraid it’s easy to broke. Yamaha model is my choice. Thanks for sharing!